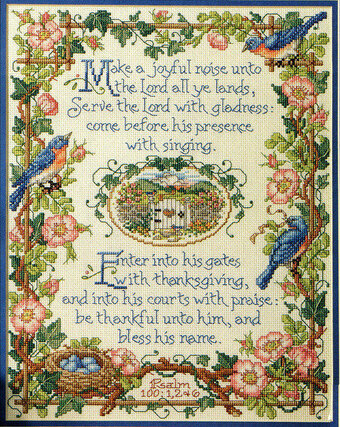 "Make a Joyful Noise Unto the Lord". Vines and Bluebirds border the words from Psalm 100 to create an inspirational way to declare God's glory. A garden gate leading to a lush meadow is centered between the verses. Each chart pack comes with a full color image, chart, DMC floss color guide, and general directions. Stitch Count 150w X 191h, Finished Size on 14ct: 11" x 14". Design by Sandy Orton. 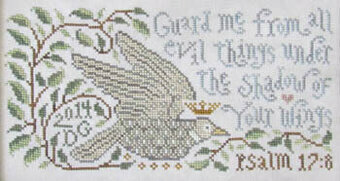 "He shall cover you with His feathers and under His wings you shall take refuge" Model is stitched on included 40 Ct. Silk Gauze using Classic Colorworks Silk (or all DMC floss 642, 934, 822, ecru) Stitch count is 146W x 83H. Beloved for its comfort and enlightenment, it's the inspiration for this beautiful treasure! 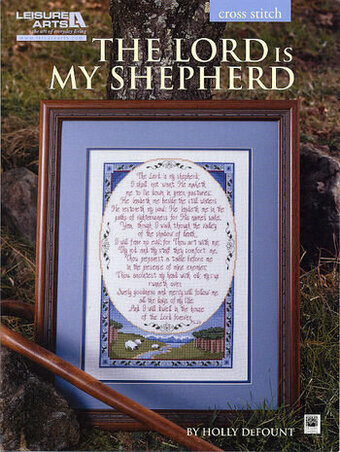 "The Lord is my shepherd..." is stitched in the form of the cross and the corners are filled with divine images of the shepherd, his sheep and an awe-inspiring cloud-filled sky. 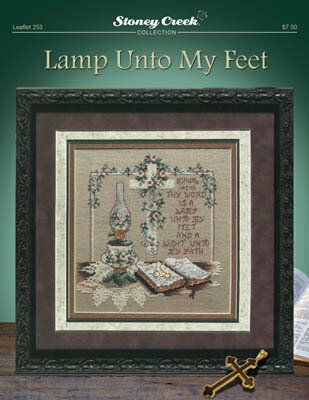 This Counted Cross-Stitch design will become a cherished heirloom. Every stitch has the magic to elevate your mood and transport you far from the daily hustle and bustle. Stitch Count 154w X 224h, Finished Stitch Size 11" x 16". Design stitched on 14-Count Antique White fabric. Design by Sandy Orton. "The Lord is good and His love endureth forever." Kit includes 32 Ct. Lambswool Linen, pattern and beads. Also required, but not included in the kit, Weeks Dye Works thread (or 931, 3790, 611, 3354, 310, 3371, 3740,3687, 783, 712). Approximate design size: 3" x 7". Includes bonus Bee Kind chart. 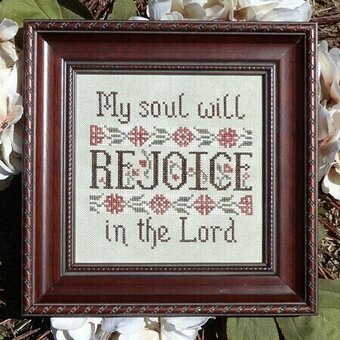 "My Soul will rejoice in the Lord." Model stitched over 2 tghreads on 28 Ct. hand dyed Thyme Jobelan with Weeks Dye Works floss. Stitch Count: 69W x 69H. "My soul finds rest in God alone. From Him comes my salvation." Psalm 62:1. Model stitched over 2 threads on 28 Ct. Queen Anne's Lace Jobelan with Weeks Dye Works floss (or DMC 936, 3021, 3777). Stitch Count: 92W x 92H. "Guard me from all evil things under the shadow of your wings. 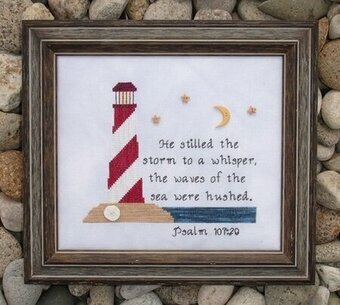 Psalm 17:8" Model stitched on 32 ct. Jobelan using The Gentle Art Sampler Threads and Weeks Dye Works. Stitch count is 135 x 69. "Bless the Lord O my soul." Model stitched over 1 thread on 40 Ct. Silk Gauze (included in this chart pack). Using Gentle Art Sampler threads & Weeks Dye Works. Stitch count 149x78. "The Lord watches over all who love him - Psalm 145:20". Model stitched on 32 Ct. Tumbleweed linen with Weeks Dye Works (Fawn, Chestnut, Red Pear, Lancaster Red, Kudzu) and Gentle Art Sampler Threads (Sarsparilla, Chamomile). Stitch Count: 123W x 93H. 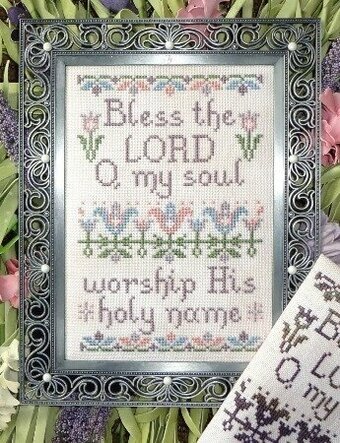 "Bless the Lord O my soul, worship His holy name." Psalm 103:1. Model stitched on 32 Ct. Iced Coffee linen with DMC floss and Caron Waterlilies. Stitch Count: 61W x 93H. 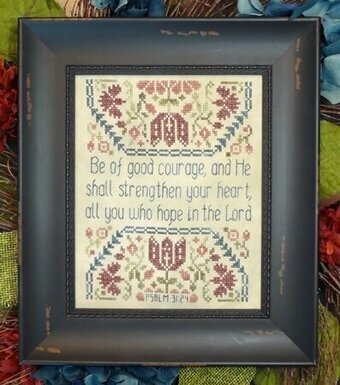 "Be of good courage, and He shall strengthen your heart, all you who hope in the Lord. Psalm 31:24." 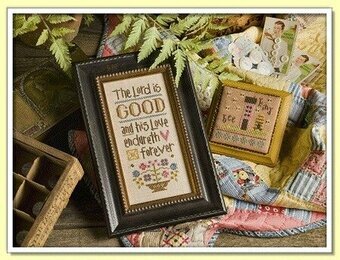 Model stitched over 2 threads on 32 Ct. Vintage Lentil by Lakeside Linens with Gentle Art Sampler threads. Stitch Count: 75W x 97H. 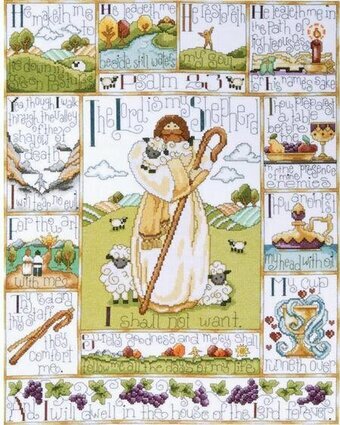 The eloquent words of Psalm 23 are beautifully presented in this cross stitch pastoral scene by Holly DeFount of Kooler Design Studio. 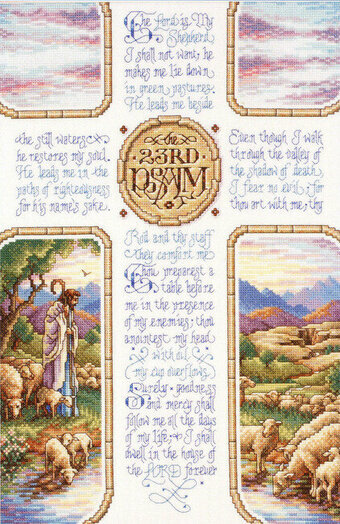 A leafy vine fills the border around the peaceful depiction of sheep grazing along a stream. Model stitched on 25 count antique white lugana with DMC floss. Stitch count is 120W x 178H. 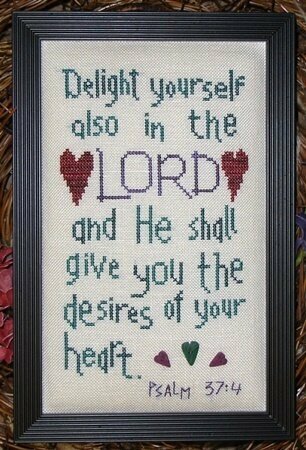 "Delight yourself also in the Lord and He shall give you the desires of your heart. - Psalm 37:4" Model stitched on 28 count Platinum Cashel Linen with Crescent Colours and Just Another Button Company (3337S-need 2, 3339M). Stitch Count: 62W x 105H. Stitched on 32 count Lentil Linen with Gentle Art Sampler Threads (Baby Spinach-120 yds., Sugarplum-10 yds.). The stitch count is 243W x 403H. "Children are an heritage from the Lord." Design can be stitched over one thread on 40 Ct. Silk Gauze or over 2 threads on 36 Ct. Magnolia linen. "He stilled the storm to a whisper, the waves of the sea were hushed. - Psalm 107:29" Model stitched on 28 count Bluebell Hand-dyed Jobelan with DMC & Weeks Dye Works and Just Another Button Company buttons. Stitch Count: 100W x 86H. 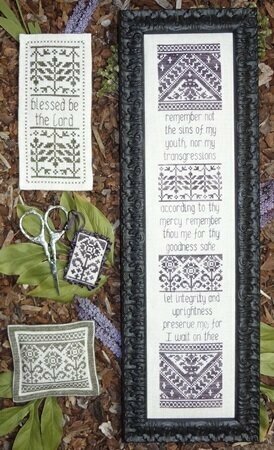 "Remember not the sins of my youth, nor my transgressions. 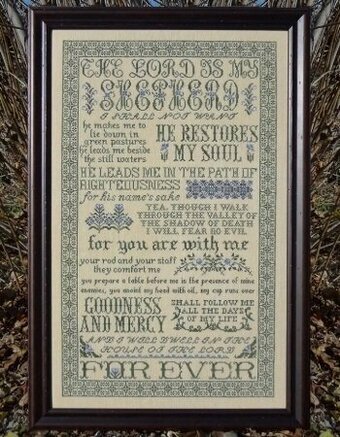 According to thy mercy, remember thou me for they goodness sake. Let integrity and uprightness preserve me, for I wait on thee." "Blessed by the Lord." All models stitched on flax linen. Main design stitched on 40 Ct. - stitch count: 49W x 284H. 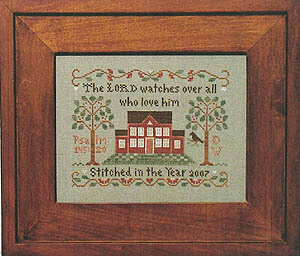 Blessed be the Lord stitched on 28 Ct. - stitch count: 29W x 76H. Pin Cushion/Ornament stitched on 36 Ct. - stitch count: 61W x 55H. Scissor Fob stitched on 32 Ct. - stitch count: 17W x 29H. Main Design and Scissor fob use Thread Gatherer Silk N Colors Aged Plum. Blessed Be and Pincushion use Thread Gatherer Silk N Colors Cypress Umber.